Major fast food chains are finding new ways to shave calories off their menu items, but one burger flipping franchise is going in the other direction. Jake's Wayback has made a towering burger with nine—count em, nine—patties, a permanent menu item. The east coast chain, which is currently expanding to 14 states across the country, has decided to put the Triple Triple on their menu after receiving over 100 orders during a test-month last year. The nine-patty Triple Triple—the tallest burger you can get at a major fast food restaurant—was originally offered as a limited-edition novelty item. A challenge for competitive eaters with a craving for cow, the company got a bigger response than they expected. “It’s crazy. We had one guy eat it in less than two minutes,” Gillian Maffeo, director of marketing for parent Jake’s Franchising LLC, told Burger Business. This week the company announced that the Triple Triple was here to stay. As of March 1, it will be the priciest burger on their menu at $12.99 a pop. So just how many calories are packed in a burger with nine patties? Jake’s Wayback didn't respond to our request by press time. So we were left to loosely estimate. A cheeseburger is listed at 570 calories, on the chain's website. If you multiply that by 9, you get a whopping 5,130 calories with approximately 117 grams of saturated fat. Now subtract about eight sandwich buns, since this stack is mostly meat. All told, you've got one dish with a calorie count that comes close to six buckets of KFC Fried chicken, or five Pizza Hut Meat Lovers' Pizza. Only the Quadruple Bypass Burger from the appropriately named Heart Attack Grill in Dallas, Texas, puts the Triple Triple to shame. 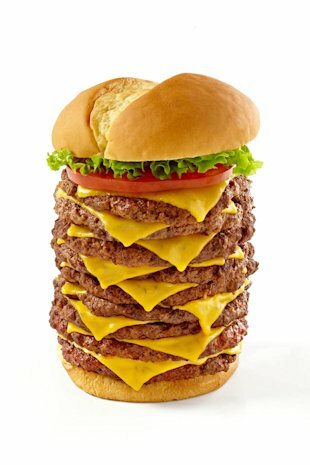 This burger, with four half-pound patties, clocks in at an insane 8,000 calories and its bun is smothered in lard. Though the recommended caloric intake per person varies depending on one’s height, weight, level of activity, and gender, it’s safe to say that consuming just half of the Triple Triple will put you over your intake for the day. EDIT: And I just realized I spelled ridiculous wrong. That's probably more meat than I eat in a year. Just looking at it gives me the shits. Is that an extra Double Double or part of the same sandwich? The double double is to pay for the buns. Got it. I was going to say this is proof that regardless of whatever you order, you always have to get an extra double double.